One spray has .5 mg of melatonin. 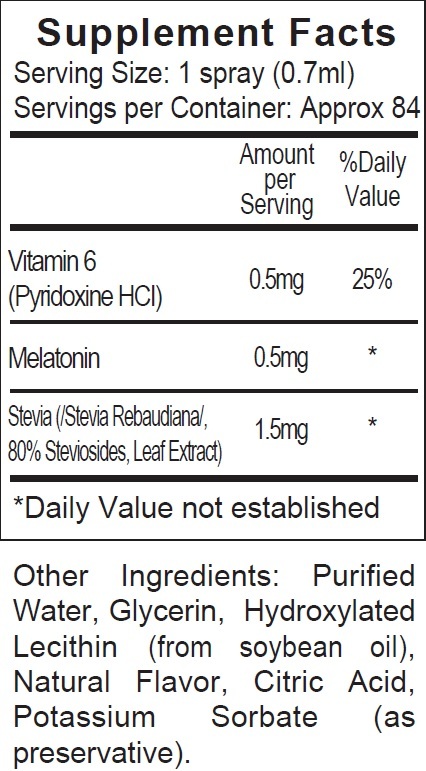 Lecithin - The liposomes in ReadiSorb Melatonin Spray are derived from lecithin. The lecithin is an extract of soy oil, not protein. Glycerin - Glycerin is used as a sweetener and preservative. It supports the stability of the liposomes and allows for the extended shelf life. Glycerin is a normal product of fat metabolism and is readily converted to glucose for metabolism. Citric Acid - Citric acid is used as a flavoring and preservative. Potassium Sorbate - A natural material used as a preservative to prevent yeast and mold growth. It is a form of sorbic acid, a naturally occurring fatty acid which is easily metabolized in the body. Potassium sorbate is used to preserve wine, baked goods and cheese.